The bank was quiet this morning as we arrived on the eastern edge, an area which has been teeming with life over the past few days. Captain Earl had us start off our whale watch with Bowline and Flock, a humpback duo that seemed to be feeding beneath the surface. The pair surfaced frequently with powerful exhalations, which suggested that they were likely very active while out of sight. A bit further south we came across Centipede and Treasure followed by Baja and an unknown. 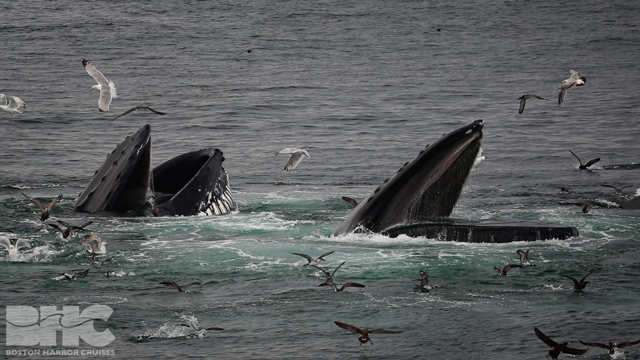 We then realized that, although the bank seemed quiet, there were actually dozens of humpbacks around. They were just very spread out. 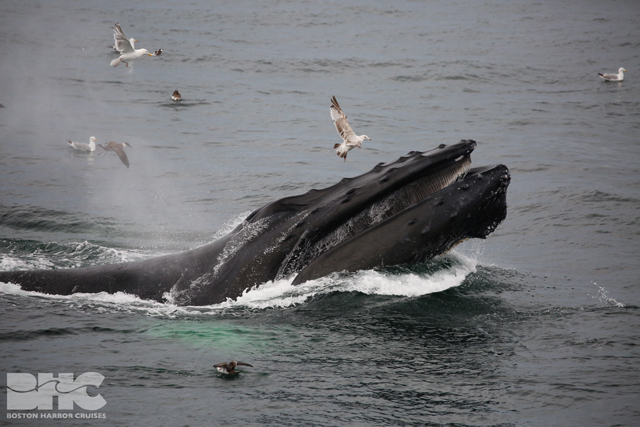 The scattered humpbacks converged in a dramatic change in activity by the time we returned on our afternoon whale watch. 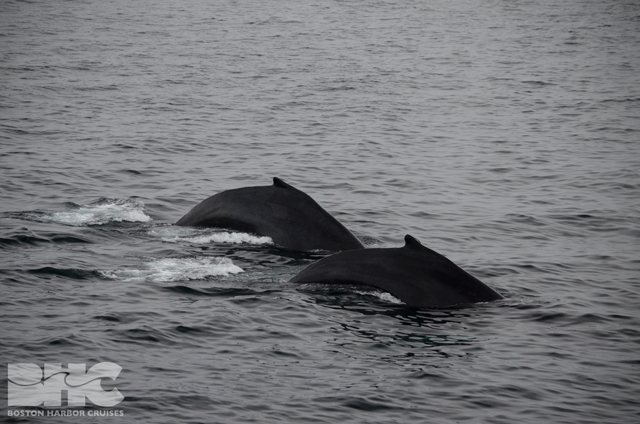 Throughout the entire trip, we were overwhelmed by the number of humpbacks that surrounded us on all sides. 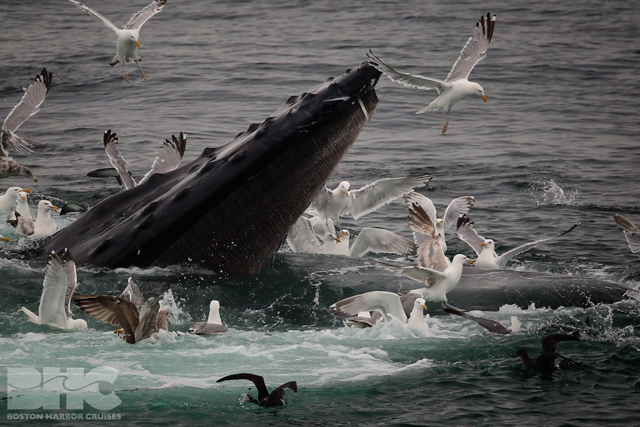 While some of these humpbacks fed in group bubble nets, others were kick feeding or flipper slapping. 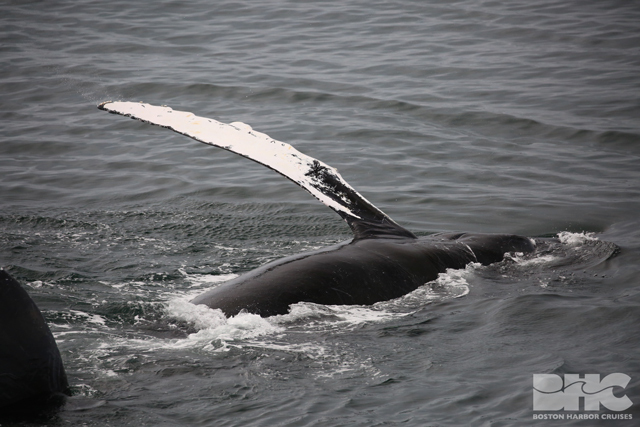 It was really an amazing sight and a fantastic whale watch. We identified over 30 different individuals including Apostrophe, Bowline, Flock, Twine, Jungle, Rune, Yoo hoo, Indiana, Crisscross, Infinity, A-plus, Jabiru, Pele, Cajun, Lavalier, Amulet, Dracula, Komodo, Treasure, Yahtzee, Centipede, Joy, Daffodil, Perpendicular, Spirit, Whiplash, Baja, and finally Music, Venom, Music, and each of their calves! Phew! What a fantastically exhausting day of whale watching! Can’t wait to get back on the water tomorrow!